Sounds like an oxymoron. 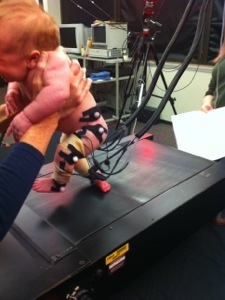 An infant on a treadmill?! How can this be?? Infants can’t even walk! After Colten was born we were invited to join an intervention study through the University of Michigan’s Kinesiology department. The study is exploring the benefits of early intervention efforts on myelomeningocele babies. They are looking at bone density, motor skills, and sensory reception. With the lack of or limited movement some of these kids have in lower extremities, fractures are common because the less use and compression of a bone, the weaker it is. It also is the belief of the research team that the “walking reflex” infants have through about 6 weeks, which then disappears until around 8 months, is something to be captured and utilized instead of shut down. They think the reflex doesn’t actually go away, that the body simply becomes too heavy for the child to move in that way. So encouraging continued use of the walking motions and watching the overall weight gain could help in the long run. This past Thursday, Colten went through an initial evaluation consisting of some base measurements of his body and a video of his movements. The team extracted quite a bit of data from his movements and even registered movement from his calf (gastrocnemius) and shin (tibialis anterior) muscles, which we did not anticipate. A big part if me wants to ignore this finding because it gives me a lot of hope. That sounds weird but I think mentally I flip-flopped from my original perspective of “hope for and expect the best, and deal with the bad as it comes”. I felt we kept getting kicked down at the beginning (higher defect level, shunt, then shunt revision) and my hopes kept getting shattered. So recently I find myself having more of a worst-case scenario outlook. I feel like I’ve accepted a wheelchair as the end result, and if we don’t wind up there then GREAT, we’ll take it! The team came out to our house today to complete some more evaluation including reflex testing and to bring us our infant treadmill and train us in Colten’s daily workout options. He was in a much better mood today and really took some “steps”. What is actually happening is that as the treadmill moves, Colten’s legs are pulled behind him and cause a feeling of imbalance. 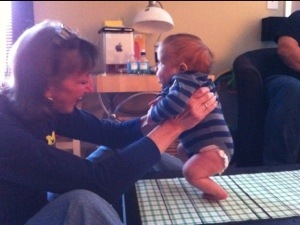 This makes him want to regain a sense of balance and pull his legs under him or more forward. Because he has quad movement and strong hip flexors, he can do this. More so on the left than the right. His right leg tends to drag behind him quite a bit and doesn’t bother him as much. This could be due to a more severe lack of sensation in that foot/leg compared to the left side. But he does pull the right forward a couple of times. The treadmill has a slightly tacky feel to it. In typically-developing children, a normal treadmill works fine. In myelo kids, the research team found those treads to be too slippery. The tackiness allowed these kids to feel it more. Then the team found that adding a pattern to the tread encouraged more engagement during treadmill time, at least once the children were closer to and beyond six months of age. Besides treadmill time, Colten will do “baby steps” and bounces as part of his 10-minute workouts, five times per week. “Baby steps” are done by holding Colten over a flat steady surface like a counter or table, or even the treadmill turned off. Then by moving his body forward, we would hope to encourage the stepping reflex then as well. Bounces require us to hold Colten in front of us and get his feet to set flat on a surface (counter, our lap, the floor), then lower him to a squat position, then raise him up off the surface. Eventually we would hope he pushes off and accepts bearing weight on his legs. All of these activities are to encourage bone development. They aren’t necessarily designed to make him walk independently or even walk at all. But they should help create patterns in his brain and nervous system that certainly can aid in walking development. And the muscles used in these exercises certainly will aid in walking when the time comes. In other news, we hopefully have a big lull in medical stuff for a while. If the shunt continues functioning, we may not have to return to Mott for a few months! Colten starts in-home physical therapy after Thanksgiving and we start treadmill activities now. Other than that, we are hoping for a quiet, enjoyable holiday season! So if you don’t hear from us too often, assume things are progressing as expected. Thanks to everyone that has reached out, visited, cooked, donated, hugged, partied, babysat, called, sent cards, or supported us in any way! The past couple months certainly were made a bit easier because of each of you. Thank you!!! This entry was tagged Treadmill study. Bookmark the permalink.